The Nebraska Cornhuskers face the Minnesota Golden Gophers on Saturday at TCF Bank Stadium. The opening line for this game has Nebraska as 1.5 point favorites and the over/under was set at 46.5. Tommy Armstrong finished his last game with 129 yards through the air for Nebraska. He completed 11 passes out of 28 attempts for a 39% completion percentage. Andy Janovich was the rushing leader for the Cornhuskers last game. He carried the ball 3 times for an average of 20 yards per carry and ended with 59 yards. Alonzo Moore led the team in receiving. He had a total of 41 yards on 1 receptions for an average of 41 yards per catch in the game. As a team in that game Nebraska totaled 325 yards by way of 65 plays. They rushed the ball 37 times for a total of 196 yards on the game and the Cornhuskers totaled 13 first downs by getting 5 rushing, 7 passing and 1 by penalty. 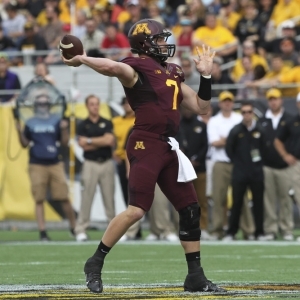 Mitch Leidner finished his last game with 59 yards through the air for Minnesota. He completed 8 passes out of 12 attempts for a 67% completion percentage. Shannon Brooks was the rushing leader for the Golden Gophers last game. He carried the ball 17 times for an average of 10 yards per carry and ended with 176 yards. Brandon Lingen led the team in receiving. He had a total of 22 yards on 3 receptions for an average of 7 yards per catch in the game. Minnesota totaled 408 yards by way of 66 plays. They rushed the ball 48 times for a total of 326 yards on the game and the Golden Gophers totaled 17 first downs by getting 13 rushing, 4 passing and 0 by penalty. Nebraska is averaging 29.8 points per game on the offensive side of the ball. They are completing 19.2 passes per game on 36.3 attempts for a 52.8 percent completion percentage and average 255.5 yards in the passing department per game. The Cornhuskers carry the ball for an average of 193.7 yards per game on 36 attempts for an average of 5.4 yards per carry this season. They are also running 72.3 plays per game and average 6.2 yards per play for an average of 449.2 yards per contest. The Cornhuskers manage 21.7 first downs per contest and they average a total of 82.8 penalty yards on 9.7 penalties. Nebraska gives up 23.8 points per contest and an average of 348.5 passing yards each game on the defensive side of the ball. They allow an average of 25.3 completed passes on 45 attempts for a completion percentage of 56.3. The Cornhuskers allow an average of 95.3 rushing yards per game on 28.7 carries for a 3.3 average. Nebraska allows 443.8 total yards per game including 6 yards per play. They force 1 turnovers per contest and get flagged for 7 penalties for 61.8 yards per game. Minnesota is putting 19.7 points on the board per game on the offensive side of the ball. They complete 17.8 passes per game on 31.3 attempts for a 56.9 percent completion percentage and average 176.5 yards in the passing department for each outing. The Golden Gophers carry the ball for an average of 172 yards per game on 40.2 attempts for an average of 4.3 yards per carry. They also run 71.5 plays per game and average 4.9 yards per play for an average of 348.5 yards in each contest. The Golden Gophers are gaining 17.7 first downs per contest and they average 50.2 penalty yards on 5.8 penalties per game. Minnesota surrenders 19 points per game and 163.3 passing yards each outing on the defensive side of the ball. They allow 17.3 completed passes per game on 32.8 attempts for a completion percentage of 52.8. The Golden Gophers allow an average of 142.8 rushing yards per game on 38.8 carries for an average of 3.7 yards per carry. Minnesota allows 306.2 total yards per game for an average of 4.3 yards per play. They force 1.7 turnovers per contest and 6.3 penalties for 49.3 yards in each contest.